ADA Approved, navigating through doorway thresholds is no longer an issue with the Extra Thick Floor Transitions Reducers. Available in 15 different sizes, the ramps easily fit in front of any door or other vertical barriers where access by wheelchair can be a challenge. Made from 100% recycled rubber, they provide an effortless transition from one height to another. 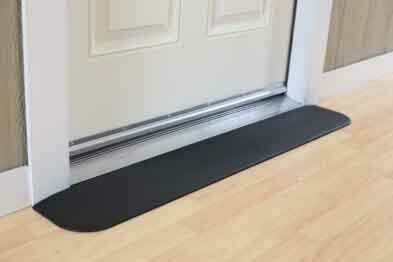 Extra Thick Floor Transitions are most often used for door thresholds, sliding glass doors, entryways, or any path of travel with a vertical barrier. Available in hundreds of configurations and pre-cut and fitted for quick, easy installation, the Extra Thick Floor Reducers provide a smooth transition for misaligned floors from a 1/2" up to 2-34" custom sizes. Transitions have no weight bearing load limit, and won't freeze, crack or splinter and require no mechanical fasteners. Works well for high traffic. Thank you for your review. We very much appreciate the feedback.